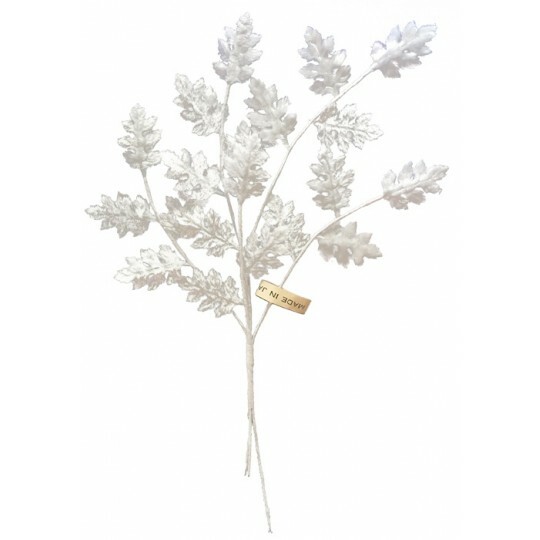 Our selection of vintage and contemporary leaves and sprigs have all been created and assembled by hand with meticulous attention to detail, including richly embossed velvet, carefully wrapped wire stems and vibrant fantasy colors. One spray of vintage embossed velvet leaves in multi colored ombre -- pink, aqua, green and magenta. 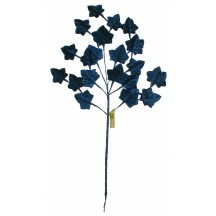 8 branches with 3 leaves each for a total of 24 leaves. Leaves measure approximately 1" long by 1" wide. Sprig measures 9" long overall. 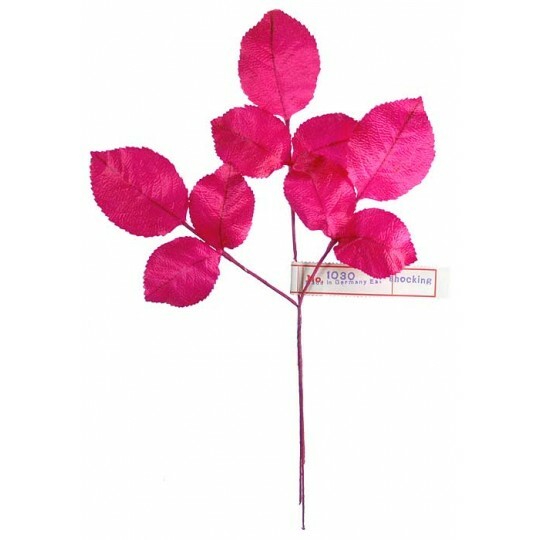 Some sprays have attached paper tags that read "Made in Japan"
One spray of vintage embossed velvet leaves in multi colored ombre. 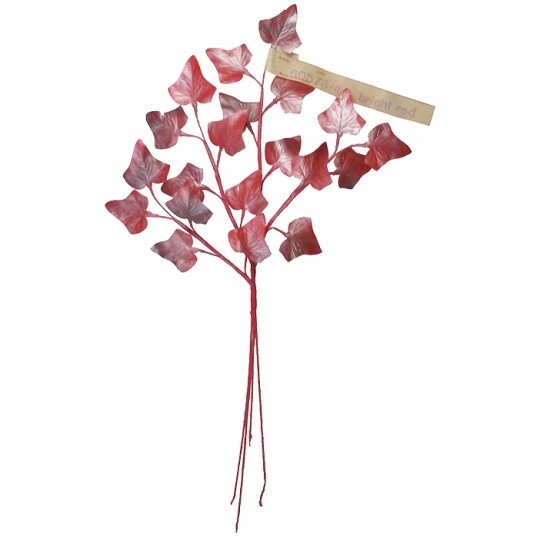 5 branches with 3 leaves each for a total of 15 leaves. 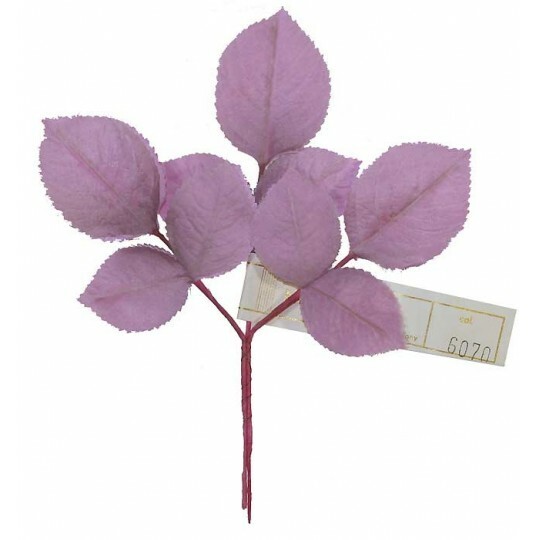 Leaves measure approximately 1" long by 7/8" wide. Sprig measures 7-1/2" long overall. Some sprays have attached paper tags that read "Japan Floradorn"
One spray of vintage embossed velvet leaves in navy blue. 8 branches with 3 leaves each for a total of 24 leaves. Leaves measure approximately 1" long by 1" wide. Sprig measures 9" long overall. 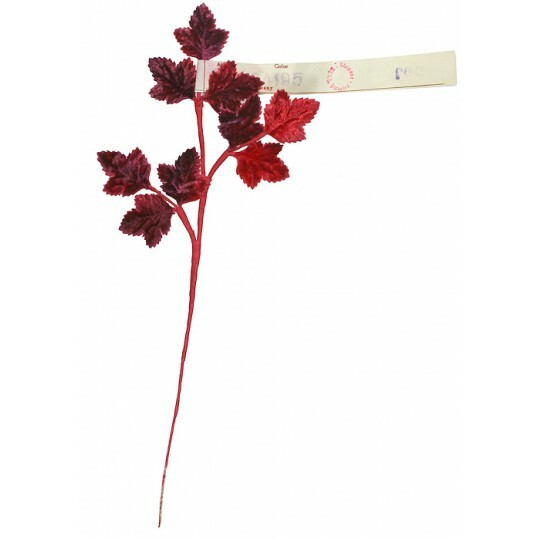 Some sprays have attached paper tags that read "Made in Japan"
One spray of vintage embossed maple leaves in wine red ombre. 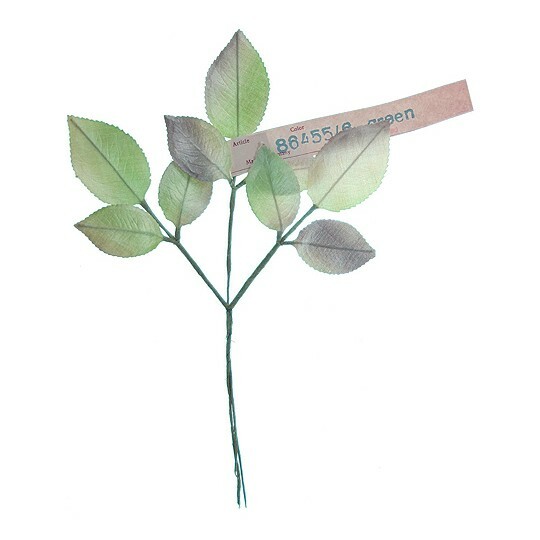 Leaves measure approximately 1" long by 7/8" wide. Sprig measures 8-1/2" long overall. 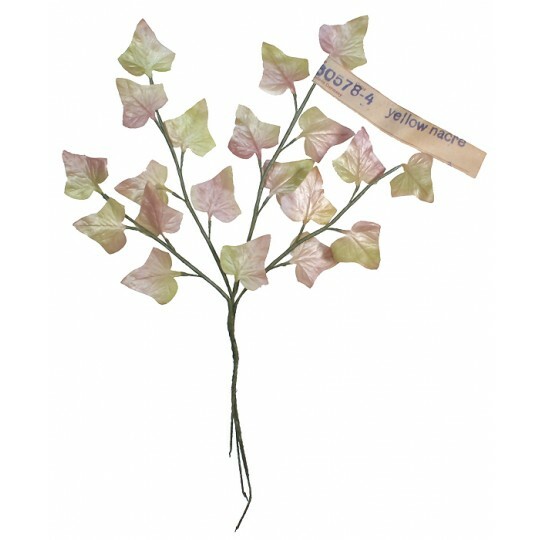 Some sprays have attached paper tags that read "Made in Germany"
Sprig of vintage old store stock velvet strawberries and nuts with leaves in pink ombre. Strawberries and nuts both measure 2" long x 1-1/2" wide. 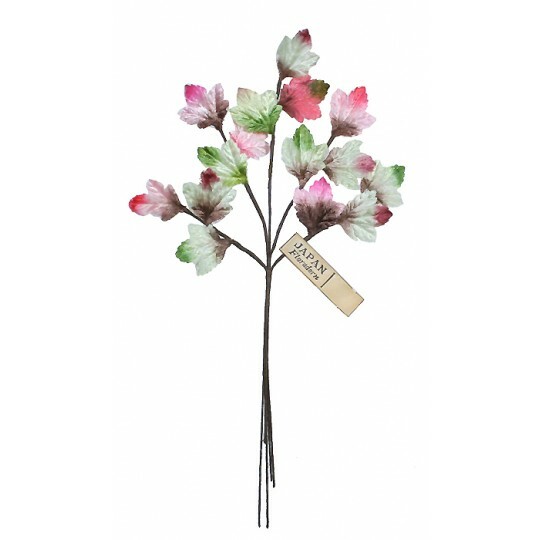 Overall length of the sprig is 10". 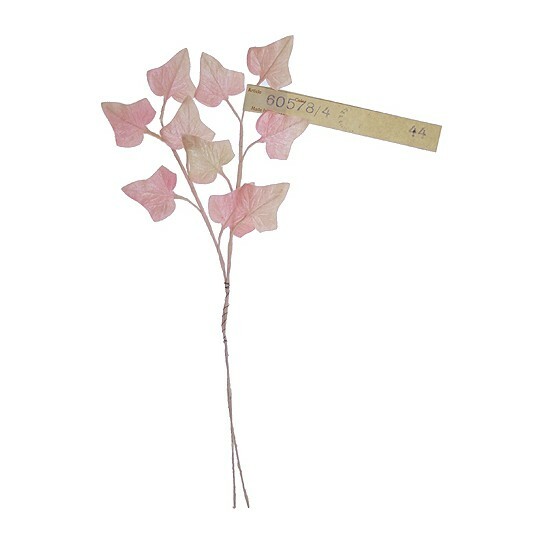 Some sprigs have original paper tags that read "Made in Japan". 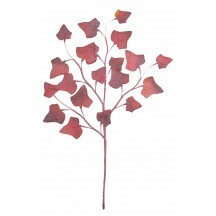 Sprig of vintage old store stock velvet berries with green leaves. Largest berry measures 1-5/8" long x 1-3/8" wide; leaves are 1-3/4" long. There are three branches, each with 3 leaves and 4 mixed berries. 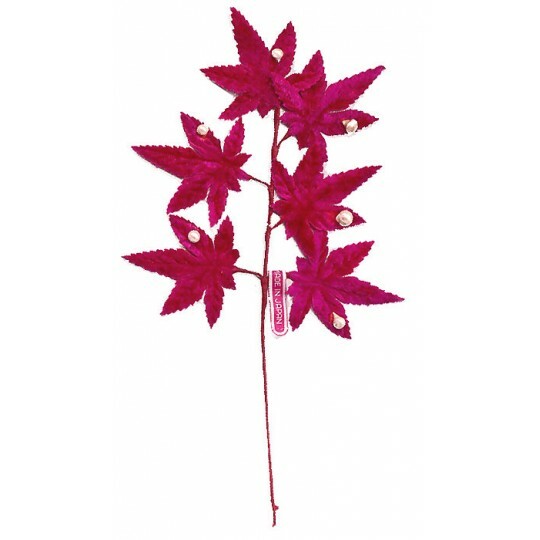 Overall length of the sprig is 10-1/2". 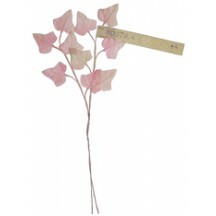 Some sprigs have original paper tags that read "Made in Japan". 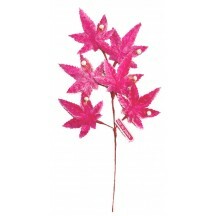 Sprig of vintage old store stock velvet leaves in a mix of fuchsia, light pink and green. Largest leaves measures 2-1/4" long x 1-1/2" wide; smaller leaves are 2" long x 1-1/8" wide. 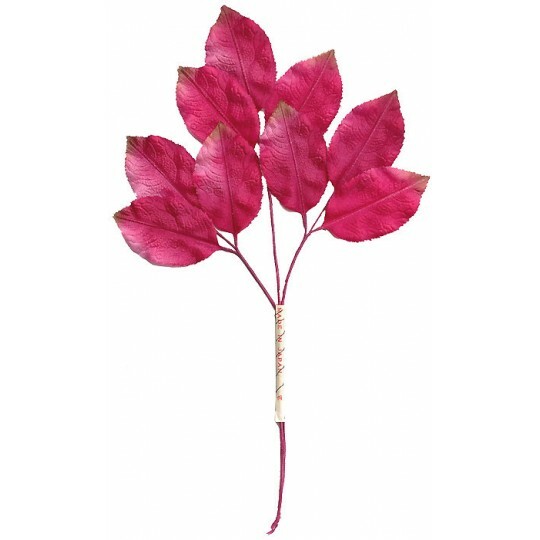 There are six branches, each with 3 leaves for a total of 18 leaves. 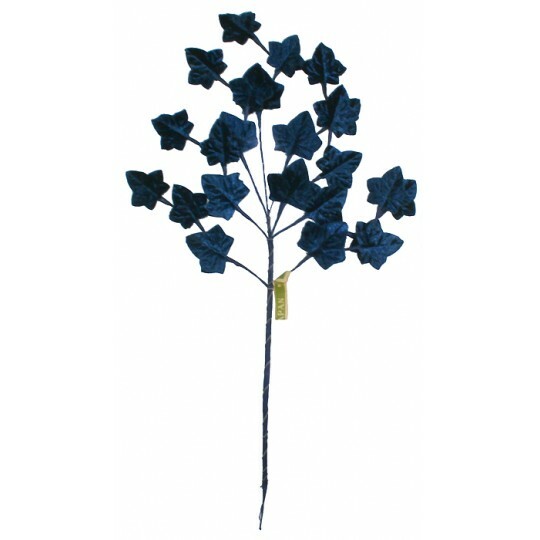 Overall length of the sprig is 11". Some sprigs have original paper tags that read "Made in Japan". 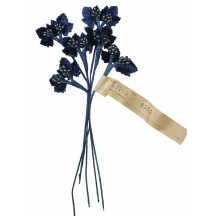 One bundle of vintage embossed leaves in navy blue velvet with blue pearlized berries. There are 6 individual stems, each with two leaves and two berry clusters. 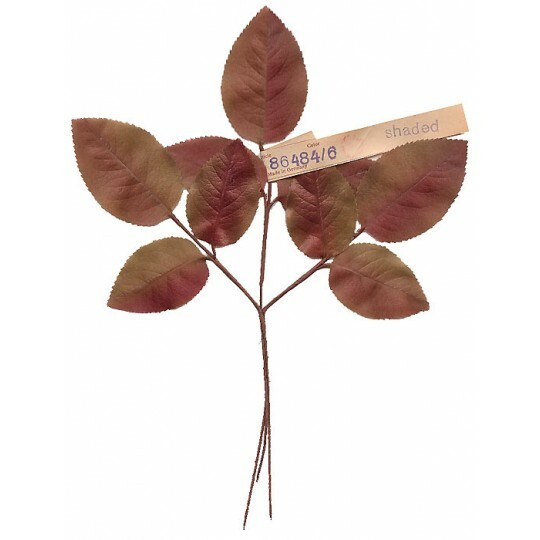 Leaves measure 1" long by 7/8" wide. 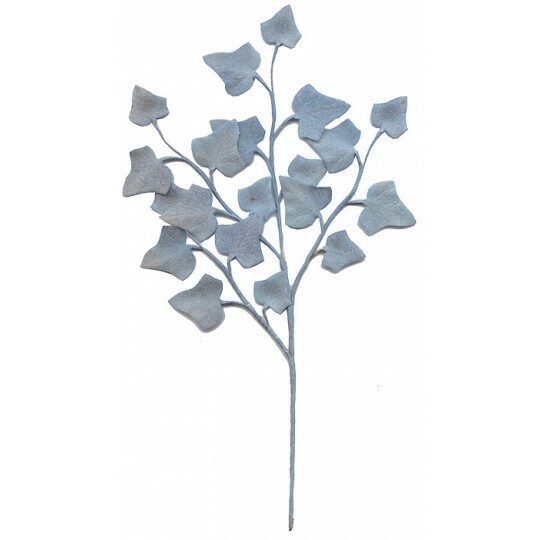 Spray measures approximately 7" long overall. Berries measure approximately 1/8" wide. Some sprays have an attached paper tag that reads "Made in Germany". 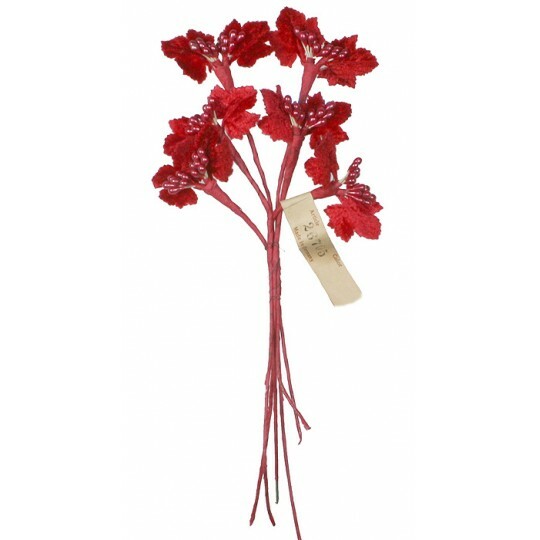 One bundle of vintage embossed leaves in red velvet with red pearlized berries. There are 6 individual stems, each with two leaves and two berry clusters. 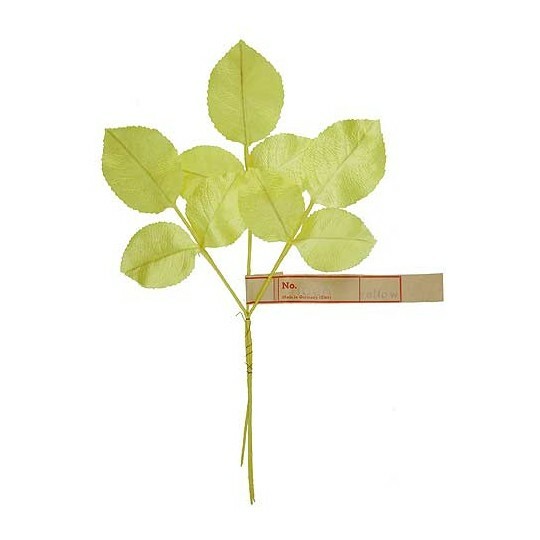 Leaves measure 1" long by 7/8" wide. 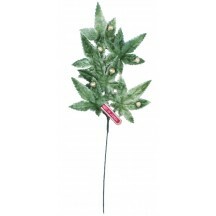 Spray measures approximately 7" long overall. Berries measure approximately 1/8" wide. Some sprays have an attached paper tag that reads "Made in Germany". 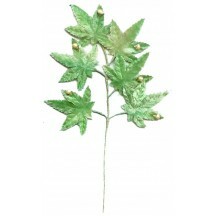 One spray of 6 vintage embossed velvet leaves in green ombre with off white pearl berries. 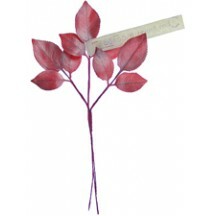 Leaves measure 1-5/8" long by 1-1/2" wide. Spray measures 6-1/2" long overall. Faux pearl berries measure just over 1/8" wide. Some sprays have an attached paper tag that reads "Made in Japan". One spray of 6 vintage embossed velvet leaves in light green ombre with off white pearl berries. 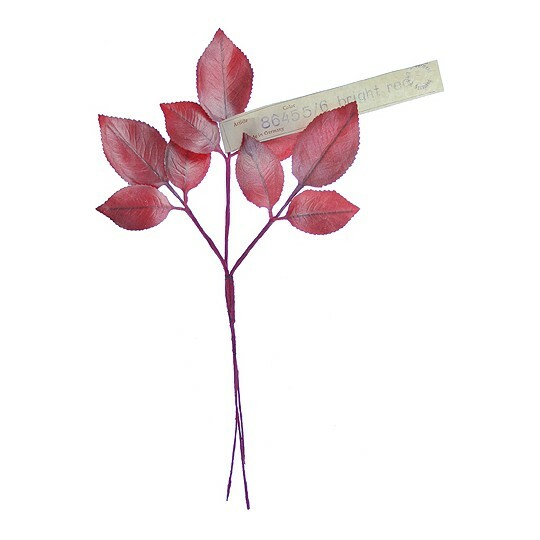 Leaves measure 1-5/8" long by 1-1/2" wide. Spray measures 6-1/2" long overall. Faux pearl berries measure just over 1/8" wide. Some sprays have an attached paper tag that reads "Made in Japan". 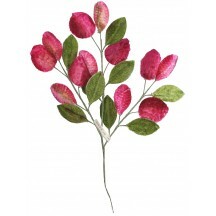 One spray of 6 vintage embossed velvet leaves in light pink ombre with off white pearl berries. Leaves measure 1-5/8" long by 1-1/2" wide. Spray measures 6-1/2" long overall. Faux pearl berries measure just over 1/8" wide. Some sprays have an attached paper tag that reads "Made in Japan". 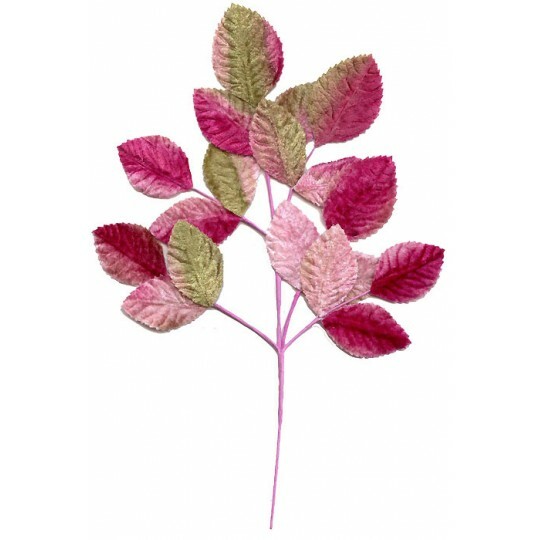 One spray of 6 vintage embossed velvet leaves in magenta pink ombre with off white pearl berries. Leaves measure 1-5/8" long by 1-1/2" wide. Spray measures 6-1/2" long overall. Faux pearl berries measure just over 1/8" wide. Some sprays have an attached paper tag that reads "Made in Japan". 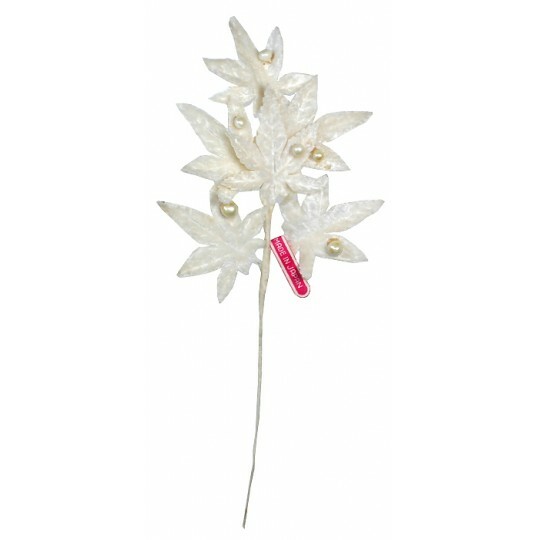 One spray of 6 vintage embossed velvet leaves in white with off white pearl berries. 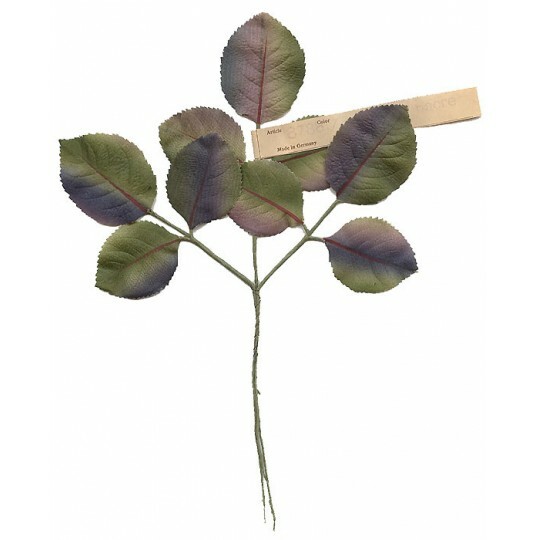 Leaves measure 1-5/8" long by 1-1/2" wide. Spray measures 6-1/2" long overall. Faux pearl berries measure just over 1/8" wide. Some sprays have an attached paper tag that reads "Made in Japan". 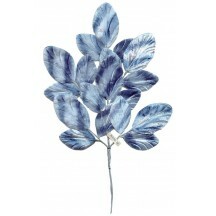 One sprig of vintage embossed fabric rose leaves in muted blue ombre. Each leaf has 2 layers -- the leaf wire is between making htese easiy reversible. 3 branches with 3 leaves each for a total of 9 leaves. Leaves measure approximately 2-1/2" long by 1-1/2" wide. Sprig measures 9" long overall. Some sprays have an attached paper tag that reads "Made in Japan". 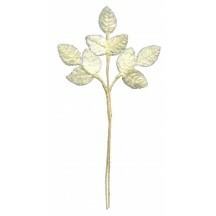 One sprig of vintage embossed pearlized fabric rose leaves in light blue. 3 branches with 3 leaves each for a total of 9 leaves. Large leaves measure approximately 2" long by 1 1/8" wide; small leaves are 1 1/2" long by 1" wide. Sprig measures 9" long overall. Most sprays have an attached paper tag that reads "Made in Germany" with a "U.S.S.R Occupied Germany" stamp. 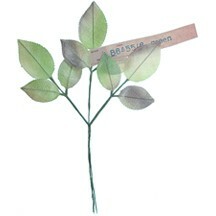 One sprig of vintage embossed pearlized fabric rose leaves in light green. 3 branches with 3 leaves each for a total of 9 leaves. Large leaves measure approximately 2" long by 1 1/8" wide; small leaves are 1 1/2" long by 1" wide. Sprig measures 9" long overall. Most sprays have an attached paper tag that reads "Made in Germany" with a "U.S.S.R Occupied Germany" stamp. One sprig of vintage embossed pearlized fabric rose leaves in red. 3 branches with 3 leaves each for a total of 9 leaves. Large leaves measure approximately 2" long by 1 1/8" wide; small leaves are 1 1/2" long by 1" wide. Sprig measures 9" long overall. Most sprays have an attached paper tag that reads "Made in Germany" with a "U.S.S.R Occupied Germany" stamp. One sprig of vintage embossed flocked fabric ivy leaves in light blue. 4 branches with 5 leaves each for a total of 20 leaves. 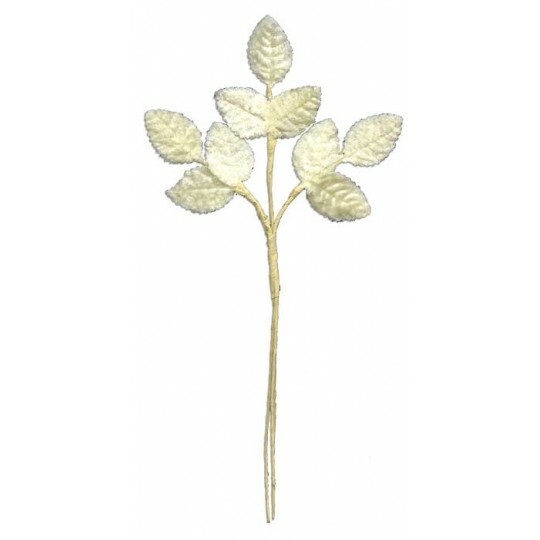 Leaves measure approximately 1-1/4" long by 1-1/4" wide, and smaller leaves measure 3/4" x 3/4". Sprig measures 10" long overall. Most sprays have an attached paper tag that reads "Made in Germany". 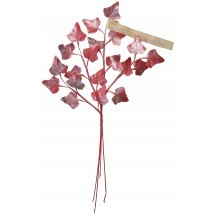 One sprig of vintage embossed flocked fabric ivy leaves in pale red. 4 branches with 5 leaves each for a total of 20 leaves. 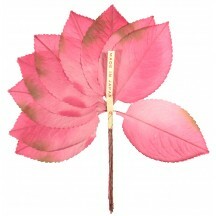 Leaves measure approximately 1-1/4" long by 1-1/4" wide, and smaller leaves measure 3/4" x 3/4". Leaf backs are a red-yellow mix. Sprig measures 10" long overall. Most sprays have an attached paper tag that reads "Made in Germany". 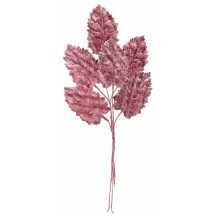 One sprig of vintage embossed pearlized fabric ivy leaves in light pink. 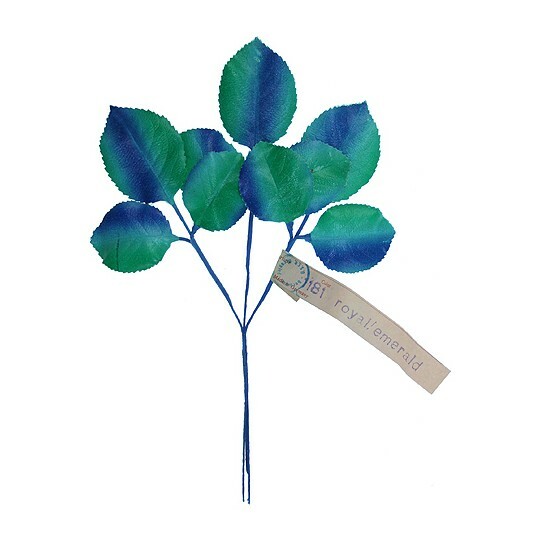 2 branches with 5 leaves each for a total of 10 leaves. Leaves measure approximately 1 1/4" long by 1 1/4" wide. Sprig measures 10" long overall. Most sprays have an attached paper tag that reads "Made in Germany" with a "U.S.S.R Occupied Germany" stamp. 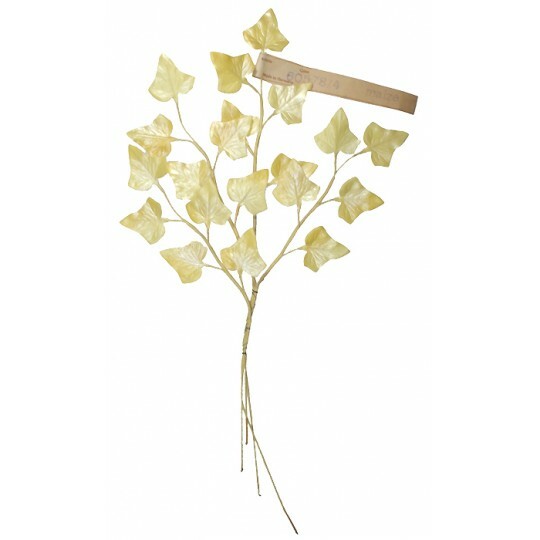 One sprig of vintage embossed pearlized fabric ivy leaves in maize yellow. 4 branches with 5 leaves each for a total of 20 leaves. Leaves measure approximately 1 1/4" long by 1 1/4" wide. Sprig measures 10" long overall. Most sprays have an attached paper tag that reads "Made in Germany". 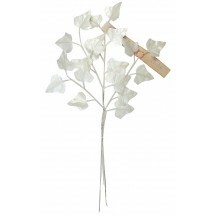 One sprig of vintage embossed pearlized fabric ivy leaves in off white. 4 branches with 5 leaves each for a total of 20 leaves. Leaves measure approximately 1 1/4" long by 1 1/4" wide. Sprig measures 10" long overall. Most sprays have an attached paper tag that reads "Made in Germany USSR Occupied". 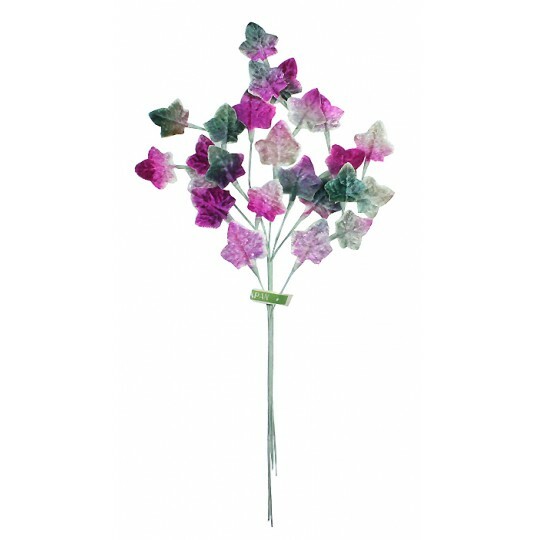 One sprig of vintage embossed pearlized fabric ivy leaves in pale green and pink ombre. 4 branches with 5 leaves each for a total of 20 leaves. 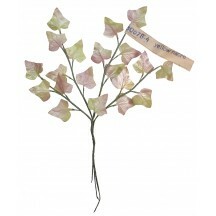 Leaves measure approximately 1 1/4" long by 1 1/4" wide. Sprig measures 10" long overall. Most sprays have an attached paper tag that reads "Made in Germany". 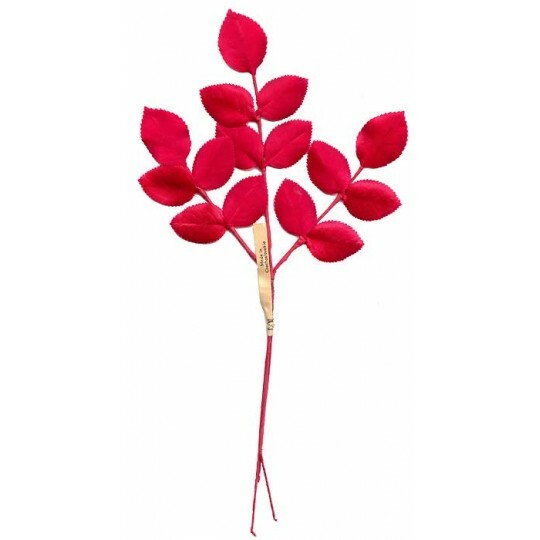 One sprig of vintage embossed pearlized fabric ivy leaves in red. 4 branches with 5 leaves each for a total of 20 leaves. 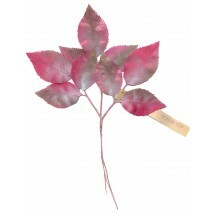 Leaves measure approximately 1 1/4" long by 1 1/4" wide. Sprig measures 10" long overall. Most sprays have an attached paper tag that reads "Made in Germany". One spray of vintage embossed velvet leaves in white. 5 branches with 4 leaves each for a total of 20 leaves. Leaves measure approximately 1" long by 3/4" wide. Sprig measures 8-1/2" long overall. 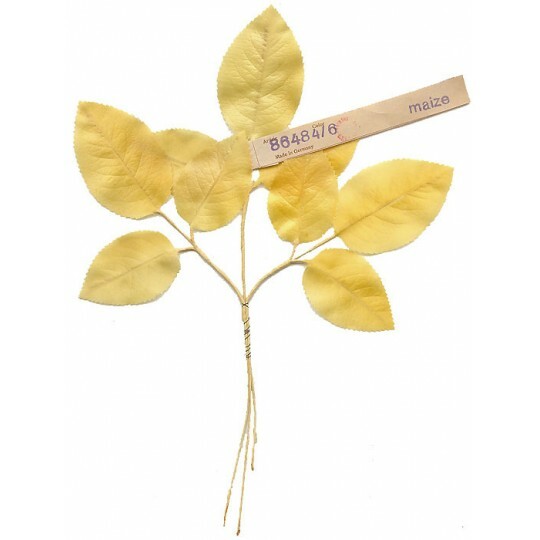 Some sprays have attached paper tags that read "Made in Japan"
One bundle of vintage embossed velvet leaves in yellow and white ombre. 3 branches with 3 leaves each for a total of 9 leaves. Leaves measure approximately 3" long by 2" wide. Sprig measures 8" long overall. Some sprays have an original paper tag that reads "Made in Japan." 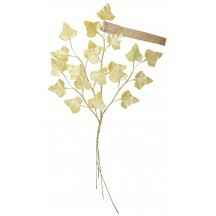 One spray of vintage embossed leaves in pale yellow. Leaves measure approximately 1" long by 5/8" wide. Sprig measures 7-1/2" long overall. 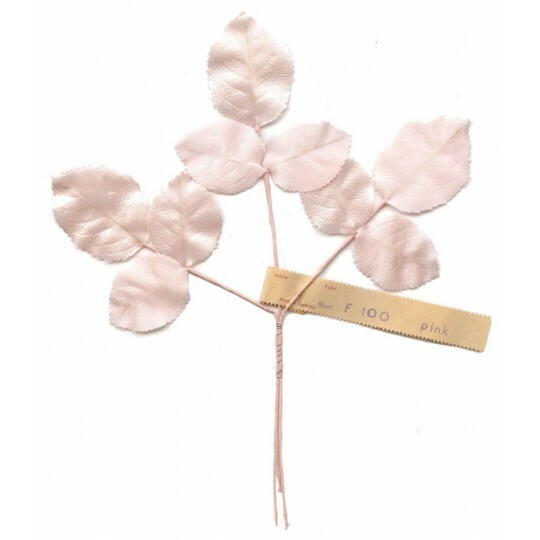 Some sprays have attached paper tags that read "Made in Germany"
One bundle of vintage embossed silk leaves in light pink with darker pink and brown accents. Bundle has a total of 9 leaves. Leaves measure approximately 3" long by 2" wide. Sprig measures 7" long overall. Some bundles have an original paper tag that reads "Made in Japan." One bundle of vintage embossed silk leaves in pink ombre with brown tips. 3 branches with 3 leaves each for a total of 9 leaves. Leaves measure approximately 3" long by 2" wide. Sprig measures 8-1/2" long overall. Some sprays have an original paper tag that reads "Made in Japan." One spray of vintage embossed silk leaves in pink ombre with brown tips. 3 branches with 3 leaves each for a total of 9 leaves. Leaves measure approximately 2-5/8" long by 1-1/2" wide. Sprig measures 12" long overall. Some sprays have an original paper tag that reads "Made in Japan." Spray of vintage old store stock velvet leaves in a mix of mauve and light pink with a striped look. 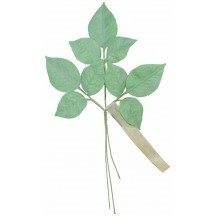 Leaves measure 2-3/4" long x 1-7/8" wide. 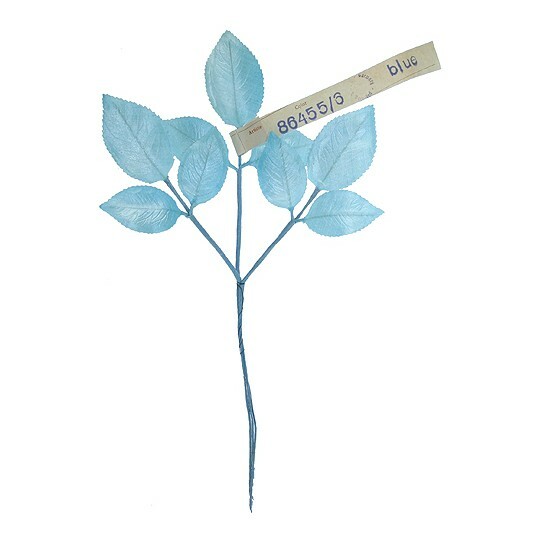 There are six leaves total. Overall length of the spray is 11". Some sprigs have original paper tags that read "Made in Germany". 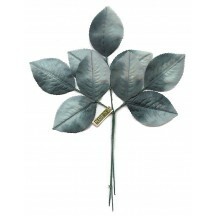 One sprig of vintage embossed fabric rose leaves in green satin. 3 branches with 3 leaves each for a total of 9 leaves. 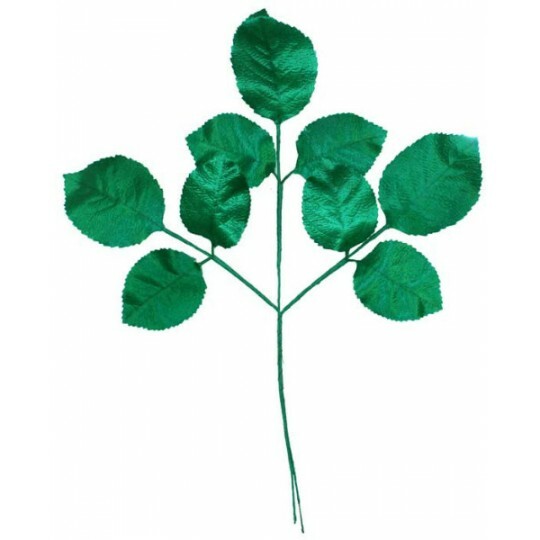 Large leaves measure approximately 2 1/8" long by 1 5/8" wide; small leaves are 1 3/4" long by 1 1/2" wide. Sprig measures 9 1/2" long overall. Most sprays have an attached paper tag that reads "Made in Germany (East)". 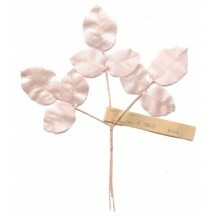 One sprig of vintage embossed fabric rose leaves in very pale pink satin. 3 branches with 3 leaves each for a total of 9 leaves. 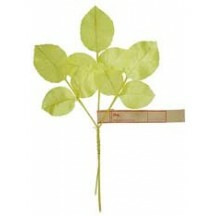 Large leaves measure approximately 2 1/8" long by 1 5/8" wide; small leaves are 1 3/4" long by 1 1/2" wide. Sprig measures 9 1/2" long overall. Most sprays have an attached paper tag that reads "Made in Germany (East)". One sprig of vintage embossed silk leaves in shocking pink. 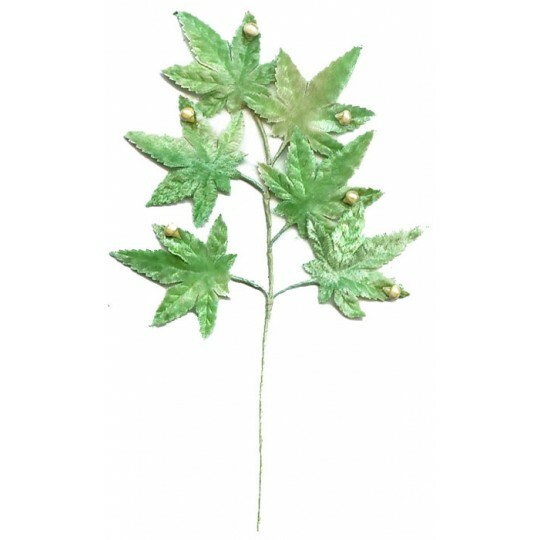 3 wired stems with 3 leaves each for a total of 9 leaves. 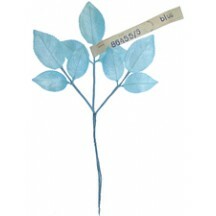 Large leaves measure approximately 2 1/4" long by 1 5/8" wide; smaller leaves measure 1 5/8" long by 1 3/8" wide. Sprig measures 10" long overall. Original paper tag reads "Made in Germany East". Not every sprig has its tag. 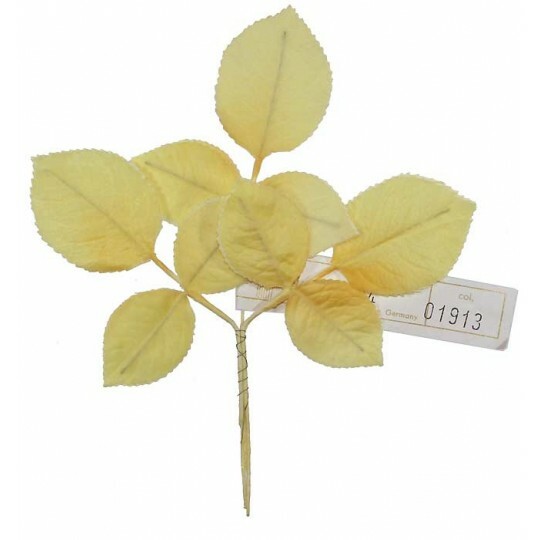 One sprig of vintage embossed fabric rose leaves in yellow satin. 3 branches with 3 leaves each for a total of 9 leaves. Large leaves measure approximately 2 1/8" long by 1 5/8" wide; small leaves are 1 3/4" long by 1 1/2" wide. Sprig measures 9 1/2" long overall. Most sprays have an attached paper tag that reads "Made in Germany (East)". One spray of vintage embossed fabric rose leaves in shaded brown satin. 3 branches with 3 leaves each for a total of 9 leaves. Large leaves measure approximately 2-1/2" long by 1-5/8" wide; small leaves are 2" long by 1-3/8" wide. Sprig measures 10" long overall. Most sprays have an attached paper tag that reads "Made in Germany USSR Occupied". 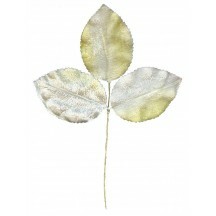 One spray of vintage embossed fabric rose leaves in maize yellow satin. 3 branches with 3 leaves each for a total of 9 leaves. Large leaves measure approximately 2-1/2" long by 1-5/8" wide; small leaves are 2" long by 1-3/8" wide. Sprig measures 10" long overall. Most sprays have an attached paper tag that reads "Made in Germany USSR Occupied". One spray of vintage embossed fabric rose leaves in black satin. 3 branches with 5 leaves each for a total of 15 leaves. 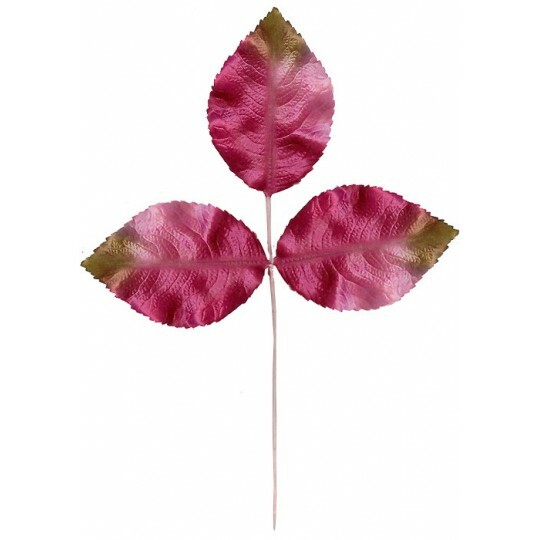 Leaves measure approximately 1-1/4" long by 7/8" wide. Sprig measures 8" long overall. Some sprays have an attached paper tag that reads "Made in Czechoslovakia". 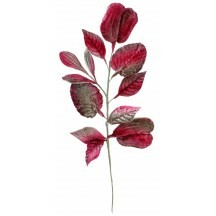 One spray of vintage embossed fabric rose leaves in red satin. 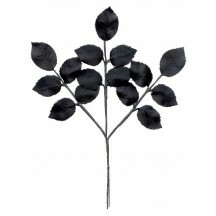 3 branches with 5 leaves each for a total of 15 leaves. Leaves measure approximately 1-1/4" long by 7/8" wide. Sprig measures 11" long overall. Most sprays have an attached paper tag that reads "Made in Czechoslovakia".